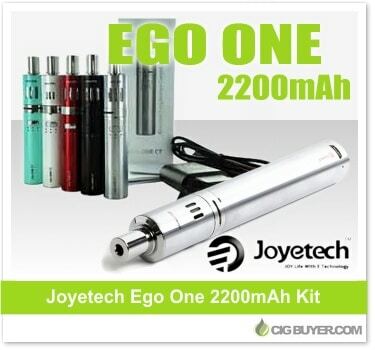 Joyetech Ego One 2200mAh Kit Deal – ONLY $19.77! When it was first released about a year ago, the Joyetech Ego One was a game changer in terms of a simplified, yet flexible device. Perfect for beginners or anyone trying to avoid overly complicated mods, the Joyetech Ego One includes a long-lasting 2200mAh battery and a 2.5ml Ego One tank with adjustable airflow. Performance is excellent considering it’s simplicity, and it can be used with either a 1.0 ohm (mouth to lung style) or 0.5 ohm (direct lung style) coils. No complicated settings, just fill the tank and puff away. 2200mAh Joyetech Ego One (Vapor Beast) - ONLY $19.77!